Simple finger poke. No blood draw needed. Collect your sample at home. 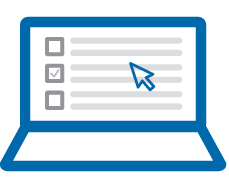 Choose the test service you would like. The sample collection kit is the same for all services and typically arrives in 3 to 5 days. Follow the simple kit instructions to collect your sample from the comfort of home. Once you have your sample collected mail it back to our lab with the pre-paid envelope. In 1-2 weeks you will receive an email letting you know your personalized results are ready. Research shows higher omega-3 blood levels are beneficial. Patients who were having a primary cardiac arrest were much more likely to have low Omega-3 Index than healthy subjects. Data from 10 prospective cohort studies including >24,000 subjects showed that an Omega-3 Index of 8% or greater was associated with the lowest risk for fatal CHD. People with the highest Omega-3 Index levels lived longer than those with the lowest levels. Participants in the Framingham Heart Study with the lowest Omega-3 Indexes had smaller brain volumes and performed worse on mental function tests. Depressed patients had an Omega-3 Index 24% lower than healthy controls. Postmenopausal women with an Omega-3 Index over 8% were 30% less likely to die than those with an Index under 4% over 15 years. Patients who had recently had a heart attack and were then treated with omega-3 fatty acids for 6 months had healthier hearts if their Omega-3 Index reached 11% compared to those with lower levels. Your results. Supported by science. Actionable: Fatty acid levels start changing as soon as you change your diet and lifestyle and stabilize in 3-4 months. Personalized: Personalized dietary recommendations based off your test results. Certified: All samples are processed in a central CLIA-certified laboratory. Validated: The same validated and standardized sample processing methodology used in over 200 research studies. Compare: Percentile ranks show you how you compare to your peers. How can I increase my Omega-3 Index? 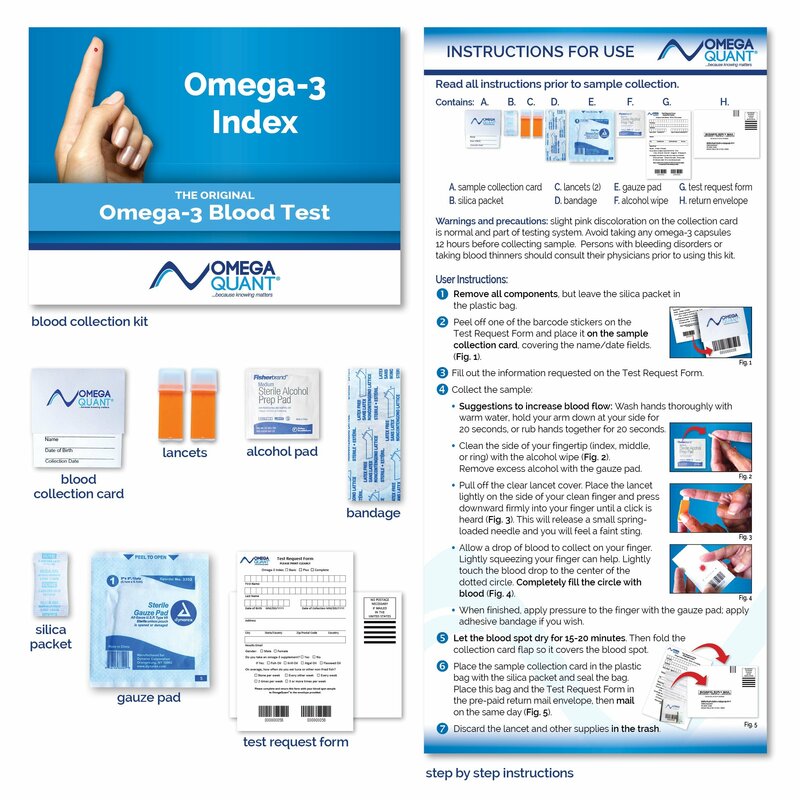 Your Omega-3 Index Basic test gives you a snapshot of the fats that make up your cells. Some fatty acid levels, such as the Omega-3 Index, are closely related to what you eat while others are more affected by your metabolism. Below we provide some information about how to improve you Omega-3 Index through diet. 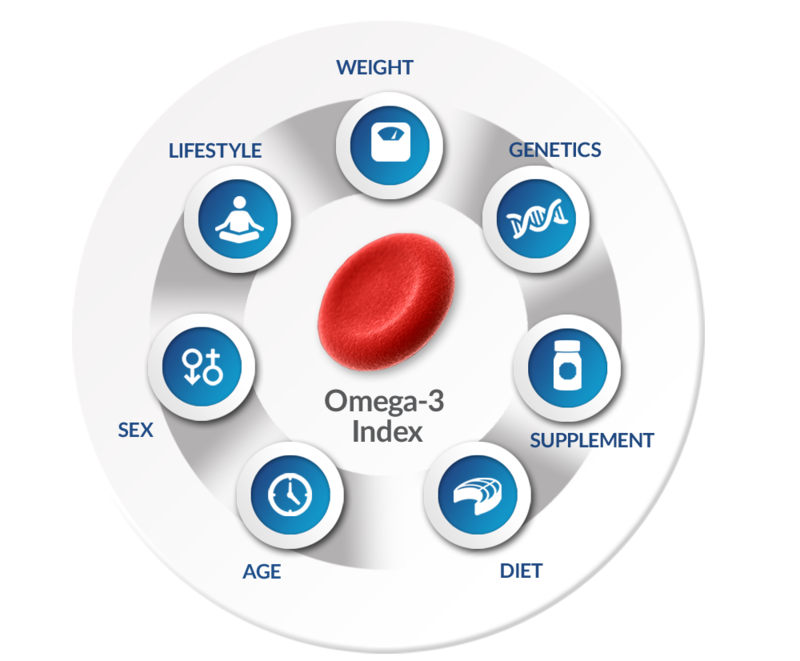 Also, use the Omega-3 Index Calculator for a personalized recommendation for EPA+DHA intake based on your Omega-3 Index. For more detail, see Increasing Your Omega-3 Index: Part 1 and Part 2. Fish oil supplements are a safe and potent source of EPA+DHA. The source and form of the omega-3s in the supplements affect how well you absorb the omega-3s, as well as whether or not you take them with food. There are also vegan/vegetarian supplements which contain omega-3s produced by algae and yeast. It is important to look at the label for the amount of EPA+DHA, specifically, that the supplement contains. For example, many supplements are 1,000 mg of fish oil but only contain 300 mg of EPA+DHA. There are some examples of the EPA+DHA levels in supplements included your report. Use the personalized estimate from the calculator to make a plan to change your EPA+DHA intake. For example, you take 300 mg EPA+DHA per day currently and have an Omega-3 Index of 4.0%. Your goal is to reach 8.0% so the calculator recommends 1075 mg EPA+DHA per day. Therefore, you would need add that amount to what you currently take, resulting in 1375 mg EPA+DHA per day (300 + 1075 = 1375 mg EPA+DHA per day). Also, it is not necessary to match the calculated dose exactly. For example, the calculator may recommend you increase your intake by 1235 mg EPA+DHA per day but you cannot find a supplement that provides exactly 1235 mg EPA+DHA. You can, however, find ones that provide 1200 mg or 1500 mg EPA+DHA. Either one is fine; the calculator is just an estimate. Follow your new EPA+DHA regimen for at least 4 months before re-testing. While EPA+DHA intake is the primary driver of your Omega-3 Index, your genes and overall health can affect the Omega-3 Index response to dietary changes. You may require more (or less) EPA+DHA to reach your target Omega-3 Index. Re-testing is the only way to determine whether you have achieved your target Omega-3 Index. *These calculations are based on results from a 5-month randomized, placebo-controlled fish oil supplementation study in 115 healthy individuals (Flock M et al. JAHA 2013). Fish is the best dietary source for the omega-3s, EPA+DHA. Dietary intake of EPA+DHA directly influences Omega-3 Index. “Fatty,” “oily,” and “cold-water” are terms used to describe fish with higher levels of EPA+DHA. A full list of fish and their EPA+DHA levels is included in your report. There are also useful websites to help guide your fish decisions. Plant-sources of omega-3s, such as walnuts, flaxseed oil and chia or flaxseeds, contain the omega-3 ALA. To a small extent, this omega-3 can be converted into EPA (and to an even smaller extent, DHA) in the body, but it is much less effective at raising Omega-3 Index levels when compared to taking pre-formed EPA+DHA. Plant-based omega-3 sources are still healthy food choices, but they will not raise your Omega-3 Index. The Omega-3 Supplement Calculator builds on the results from the Omega-3 Index Calculator to help you achieve your Omega-3 Index goal. Finding the right omega-3 supplement for you can be very confusing. The most important thing in any omega-3 supplement is the amount of EPA and DHA per serving. It's important that these values are listed on the Supplement Facts panel on the back of the bottle, instead of the general term "omega-3s." There are other things to consider when buying a supplement, like price, source, vegetarian, fatty acid form, etc., but dose outweighs all of these when it comes to changing your Omega-3 Index. If your supplement does not have specific values for EPA and DHA separately, do not buy the supplement! You cannot make an informed decision without the right information. Also, you can't use the calculator without that information. You can use the Omega-3 Supplement Calculator to compare different omega-3 supplements before buying. You can access the Supplement Facts panel for most omega-3 supplements online so you can compare how many capsules you'll have to take with different supplements. Fish Intake Calculator is in the works... Stay tuned! These statements have not been evaluated by the Food and Drug Administration. 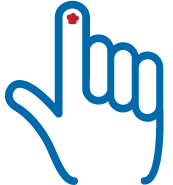 This test is not intended to diagnose, treat, cure, prevent or mitigate any disease. This site does not offer medical advice, and nothing contained herein is intended to establish a doctor/patient relationship. OmegaQuant, LLC is regulated under the Clinical Laboratory improvement Amendments of 1988 (CLIA) and is qualified to perform high complexity clinical testing. The performance characteristics of this test were determined by OmegaQuant, LLC. It has not been cleared or approved by the U.S. Food and Drug Administration. 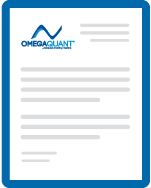 Join our mailing list to receive the latest news and updates from OmegaQuant. Our goal is to offer the highest quality fatty acid analytical services to researchers and to provide simple tests of nutritional status to consumers, with the ultimate purpose of advancing the science and use of omega-3 fatty acids to improve health.